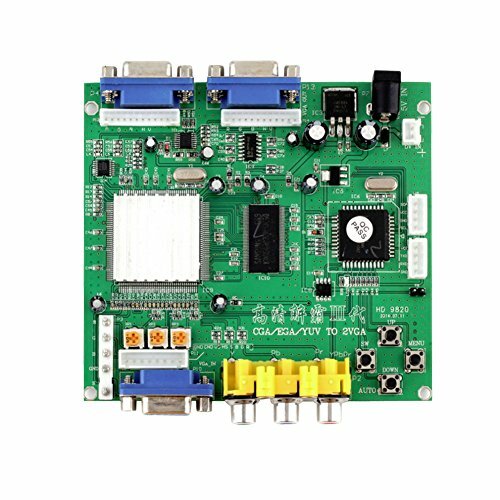 HD Dual VGA game converter wiring board (dual output, connect sparring), specifically for the gaming industry is the launch of a "high-low transfer solution solution" high-performance video processing card. The game has a strong compatibility and versatility, the solution supports a variety of high-low game (such as King of Fighters, PS2, XBOX and so on, the game support rate of 98%, also in accordance with the requirements of the upgrade). Through professional DSP chip processing output high-resolution screen, image clarity, color, supports a variety of displays, are widely used in the gaming industry. Input power: DC 5V / 1A.standard VGA output signal resolution format: 640X480,800X600,1024X768,1360X768. Input signal formats supported: RGBS, RGBHV, YPbPr (the color), CGA / EGA. Enter RGBS, RGBHV formats supported: 15KHz, 24KHz, 31KHz horizontal frequency signal pattern. YPbPr input formats supported: 480i-60, 576i-50, 1080i-50, 1080i-60, 480p-60, 576p-50, 720p-50, 720p-60, 1080p-50, 1080p-60 mode. Enter the tricolor through 1000 ohm potentiometer adjustment.